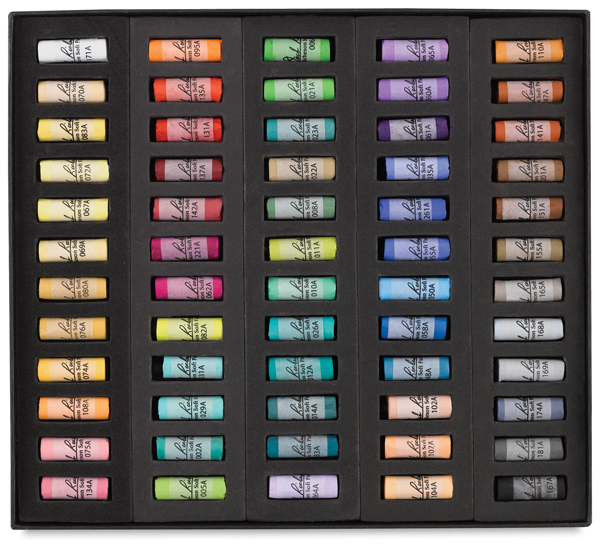 Well-made, versatile and vibrant, Richeson’s handmade, half-size, round pastel sticks have a medium-soft formulation, ideal for creating broad, smooth strokes or fine details. Use them for all types of pastel painting, from sketching to adding final touches. This set includes Gray 171, Gray 168, Gray 165, Gray 169, Gray 174, Gray 167, Gray 181, Earth 155, Earth 151, Earth 147, Earth 201, Earth 102, Earth 107, Earth 104, Earth 110, Earth 141, Yellow 108, Yellow 95, Yellow 70, Yellow 83, Yellow 72, Yellow 67, Yellow 69, Yellow 80, Yellow 76, Yellow 74, Green 82, Green 22, Green 11, Green 5, Green 6, Green 21, Green 23, Green 8, Green 10, Green 2, Green 29, Green 26, Green 12, Green 14, Green 31, Blue 33, Blue 48, Blue 50, Blue 58, Blue 35, Blue 261, Blue 55, Blue 64, Blue 65, Blue 60, Blue 61, Red 75, Red 134, Red 142, Red 221, Red 62, Red 135, Red 131, and Red 137.